What a fantastic evening it has been. I listened to the election results on NPR radio on my drive home from work. 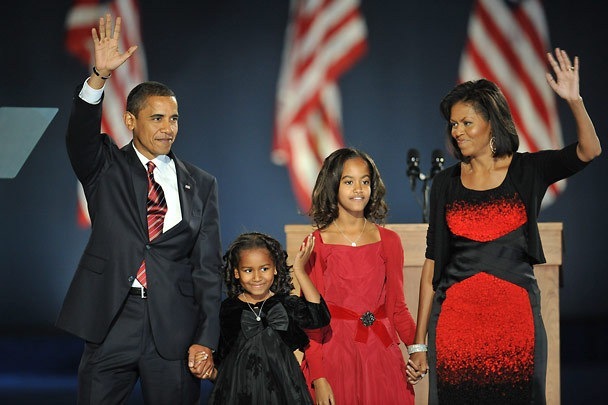 By the time I arrived home things looked very good for Obama, but I had no idea how good. Now we know how good. Americans have voted to take this great country in a new direction. I love this man’s passion and conviction. I remain optimistic that our country can come together to fix the many problems facing us today. McCain gave a gracious speech tonight. He loves this country. You could see it in his eyes. I hope Obama will keep his word and reach out to Republicans as he begins filling his cabinet positions. I’ve never stayed up late to watch an election. I’ve never donated to a campaign before. I’ve never shed tears of joy when our new president walked on stage for the first time. All that changed tonight. Godspeed, President Obama. Of all the election coverage I’ve read and watched tonight, here is my favorite article and here are some of the highlights of the night. well said. agreed. what a night. change is coming. I have enjoyed your blog and catching up. You are an excellent writer. I think your brother was in our ward in Kaysville for a short while before our ward split. I remember our families getting together for homemade ice cream. I remember your mom making us peanut butter balls (like playdough you can eat). I remember you bugging Jana by calling her Jana Banana. Wow! I thought that was really mean…and really funny. Good times. Fun to catch up with people. I thought I hated my childhood, but I am finding out that I just forgot about the good parts. Obviously I’m not a fan of the man. I do respect the race he and McCain ran this year. A fairly clean race and Obama won fair and square. I worry that people have placed this man on a very high pedestal and that it could be a politically fatal fall if he doesn’t live up to expectations. Here, here Brett!! And that article was wonderful!!! Unlike Mike I am a fan, but like Mike I worry the expectation is very high. I also hope the media gets past the “First Black” part of the conversation and engages the challenges his administration will face. My concern is which direction will he be taking the country? We really don’t know very much about him. Here’s to hoping he isn’t the radical liberal some people think he is. I hope he’s a radical liberal. Our country needs a big change, and I think he can do it. A historical day for the whole world. But I’m afraid this is a poisoned gift for Obama. This man has a lot of pressure on his shoulders.